Does your school have many volunteers? Or are you looking for ways to increase opportunities for students by involving more volunteers? If one of those situations describes your school, you're sure to gain some valuable insight from Education World's "Principal Files" principals. Included: The benefits of volunteers, plus tips for recruiting them and recognizing their efforts. Principal Teri Stokes considers herself fortunate. "We have more than 200 volunteers in a school of 600 students," she told Education World. Volunteers at Stokes' school -- Weatherly Elementary School in Huntsville, Alabama -- include parents, grandparents, retired teachers, and community members. "So many of the 'extra-value programs' we have at Weatherly are a direct result of the tremendous support we get from our volunteers," Stokes added. "Our after-school chess program is run by parents, and an incredible number of volunteer hours go into working with the student Garden Club to maintain our school's Outdoor Learning Center and Garden Center. "The large number of parents and other volunteers who work in our school each day help to create a true feeling of 'family' in our school." Stokes and many other principals are quick to recognize that volunteers contribute to their schools in countless ways. "The value that volunteers provide is undeniable," principal Tim Messick told Education World. "They not only provide tremendous support and assistance, they reinforce the partnership we work hard to develop with our parents." "There is no way that we could afford all of the 'extras' they provide," added Messick, who is principal at Providence Day School in Charlotte, North Carolina. Bridget Braney, principal at Orchard Hill School in South Windsor, Connecticut, couldn't agree more. "Our volunteers enrich students' learning experiences in so many ways. They are part of the everyday scenery in our school. Their mere presence speaks volumes to their children and to the staff. We are a better school because of our volunteers." "The biggest benefit our parent volunteers bring is that our students see that their parents value education," said Tammy Quist, principal at Estes Park Middle School in Estes Park, Colorado. "So many areas of our school could not run as efficiently and effectively without our volunteers," said Sue Astley, the elementary principal at St. Martin's Episcopal School in Atlanta. "They are supportive of our school, its faculty, and administrators. They see volunteering for what it truly is: a way to enrich the education of their children." Volunteers help in many ways to support teachers and improve academic programs at West Elementary School in Lancaster, Ohio. "They provide resources we need," said principal Paul Young, recently retired. "And they help keep us on our toes." Volunteers can benefit a school in concrete ways and in ways that are not quite so obvious. For example, Jack Noles, principal at Shallowater (Texas) Intermediate School, sees the volunteers as PR agents for his school; they can help build enthusiasm in the community for what's going on in schools. He includes volunteers in memo distributions and meetings about public-domain information such as benchmark data and school-to-school comparisons because they can help get out the 'straight' information. "Our volunteers help us spread the word to the rest of the community. They tell the good news, and they troubleshoot some misconceptions or misunderstandings that may be prevalent." Principal Gretchen Schlie, of the International Christian School in Seoul, Korea, has seen those same kinds of benefits. "Our volunteers add to the school community just by being around and seeing how things work," she said. "They are great advocates for school policy -- and the school itself -- because they are on the 'inside track'." Schlie also finds that volunteers have excellent ideas and suggestions. She would like to see the number of volunteers grow at ICS. What kinds of jobs do volunteers do in schools? The volunteers at St. Vincent de Paul Academy in Kansas City serve as an example. "Our volunteers help out in many ways," said assistant principal Heather Hamtil. "They help out with clerical functions such as producing our weekly newsletter, office notices, and mailings. We use them to get messages to classroom teachers and to do last-minute errands. Sometimes we use volunteers to provide extra supervision at recess. Some volunteers help in the classrooms. In emergencies, we even use them as substitute teachers. We use volunteers to help distribute food in the cafeteria and to collect money on Picture Day. We also use them to plan and run our annual Field Day. Volunteers help with fundraising events such as our annual jog-a-thon and our auction. Believe it or not, we even use volunteers to assist with school upkeep and cleanliness." At Shallowater Intermediate School, "we use volunteers for everything from making copies and cutting out letters and shapes to monitoring classrooms so that teachers can give reading and math assessments to individual students," said Jack Noles. "Another critical place our volunteers help out is by assisting teachers by tutoring students who are either advancing faster than others or need some acceleration." Safety Patrol Moms -- they plan and organize reward parties for our Safety Patrol members, peer mediators, and supply store students. Reading Incentive Moms -- they do a variety of jobs such as taking student pictures for the Readers Hall of Fame, contacting businesses in the area for freebies to put in the Readers Store (students can "buy" items with the points they acquire by reading), and running the Readers Store. Student of the Week Mom -- she puts together the goody bags for the Student of the Week and creates the Student of the Week certificates, which have the students' pictures on them. At Harriet Gifford Elementary School in Elgin, Illinois, volunteers assist teachers in many different ways. "One of our parent volunteers comes in every day to assist a bilingual class," said principal Joe Corcoran. 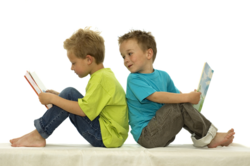 "Our reading coach, Lori Brandes, developed and runs one of our most popular volunteer programs, Reading Buddies. The program matches senior citizens and local college students with our students. Last year, volunteers logged more than 200 hours with the program, which helped boost students' skill development." At Doctors Inlet Elementary School in Middleburg, Florida, the school's Title I writing coach also coordinates the school's volunteer program. She volunteers her time in that role and manages dozens of volunteers. "We have one person, a senior citizen who had children in our school 15 years ago, who does all our photocopying and laminating," noted principal Larry Davis. "She is here six hours a day, five days a week. She just feels the need to assist the teachers because of their dedication to our students. We also have a retired college professor who runs our science lab four days a week. She sets up experiments and conducts lessons for classes that come to the lab." Volunteers serve in many capacities at Orchard Hill Elementary. "Our reading consultant and our kindergarten teacher have trained a number of parents in how to deliver one-to-one instruction for struggling readers," said principal Bridget Braney. At the grade levels above that, each grade focuses on specific curriculum units of study. "One of the best learning strategies is to have a culminating project that incorporates many concepts students have learned," Braney shared. "However, to be successful and run smoothly, those culminating projects typically require extra hands and extra efforts. That's where our volunteers are especially notable. "Our fourth grade has a special Colonial Day where students work on crafts, play games, and eat foods typical of the Colonial period. Parent volunteers help teachers by cooking the food, assisting with crafts, and supervising games. Volunteer. What does that term really mean? "I believe partner is a more accurate description of what we are looking for; and it is the term I prefer to use," Dr. Layne Hunt told Education World. "I make a concerted effort to refer to volunteers and other contributors to our schools goals as partners." It's more than semantics, explained Hunt, who is principal at Fair Plain Renaissance Middle School in Benton Harbor, Michigan. "I see the use of the term partner as a shift in perspective. I think the word connotes a more participatory role for a wider variety of constituents who have a stake in helping schools. I think a partner might feel more valued than a volunteer. "The more we use the term partner in education, the more we are likely to be successful in getting others involved in our process." "Our fifth grade has a Civil War Day that includes campfires, tents, marching, and bucket brigades. That special day would not happen if not for volunteers. "Last May we had a non-competitive field day. Five hundred students moved from station to station. Under the PE teacher's supervision, parents organized materials, set up the stations, and ensured the smooth flow of students." Parent volunteers also help organize cross-grade activities, Braney said. "For example, our room parents coordinated a class party between a first- and fourth-grade classrooms. Instead of having cookies, candy, and punch, the students created cards for veteran soldiers." The largest contingent of volunteers at Orchard Hill assists with activities of the school's fifth graders. "The teachers and I ask parents to help with advising student organizations so all fifth-grade students 'have a job.' That way, every exiting student has an opportunity to role model responsible behavior and to give back to the school." Student organizations include Student School Life, Student Government, Peer Educators, School Store, Tech Team, Yearbook Committee, CARE Committee, Library Assistants, and Student Mentors. "Students cannot join more than one representative group," Braney explained. "They must be committed to their group and the responsibilities of their position." Once each month, on a Friday afternoon, fifth graders meet with their organizations. Those meetings are led by each organization's advisor and parent volunteers. "The student organizations really help build a positive culture within our school," added Braney. And they wouldn't be nearly as successful if it was not for all the volunteers who support them. --- One School's "Volunteer Hall Of Fame"